I can't get on the WA website from my home computer for some really strange reason. Would any kind soul be willing to post the pictures of the following pistols? I'll be your best friend for ever! Fast growing fan of the MEU....carbon finish would be the bees knees. Oh my, that two tone M92FS with the white pearlite grips is gorgeous! Although, I would swap the white pearlite grips for black pearlite grips if I got one. Fortunately those pearlite grips are relatively inexpensive. Western Arms sure does make some beautiful pistols, I just wish they could take more powerful gasses without exploding. The WA 6" SV Infinity Classic (Black, SCW3) and WA M92FS DX Black Pearlite Grip Version have been my favorite pistols I've ever owned, and that's saying quite a bit since I've owned several dozen high end GBBs. None shot better than Marui, but none looked better and felt better in my hand than my WA's. And they weren't bad shooters either... just had to use them in temperate weather and feed them 134a or 152a gas only. What kind of gas do you plant to use? WA's work fine (at least the 1911 variants) on green gas. 300+ fps with .25's with great blowback out of the box; what more do you want? Just buy me a pint. You're a good man Mike! I really appreciate it mate. I also have the original WA MEU (Early Version) in Carbon Black but the finish on this one looks much better. I can only imagine that it is because my MEU was one of the first batch of CB pistols that it isn't that great as all the others I own are fantastic. If anyone doesn't have a WA CB pistol I would highly recommend you beg, borrow or steal and get your hands on one. They are really amazing. 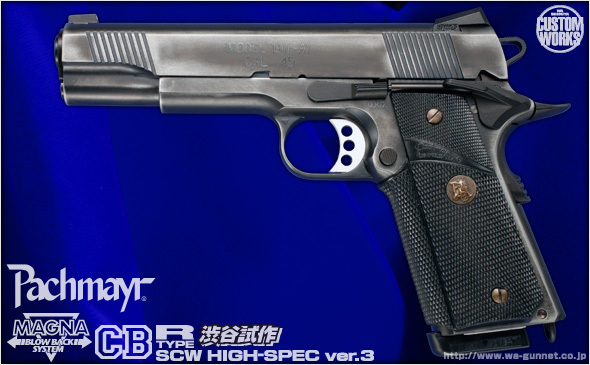 Nice new WA releases, but I don´t see a lot of HK shops stocking the new WA pistols. Which HK shop has the latest WA gbb pistols? All the 1911s i have the plesure of owning are WAs too. the popular ones never stay in-stock for too long. GunsNGuys always used to be good for the new releases but I haven't seen much on there recently. I think i'll e-mail Peter and see what he says. Tokyo Model Company have been good recently for the new releases. But unfortunately WA pistols have taken a huge price hike, you're looking at $300+ for the new models! Yeah, due to the terrible GBP to JPY conversion. Summer last year we we getting over 200 Yen to our £. Now its about 150 Yen to a £. It has got better since the beginning of this year and still showing signs of improvement. Such is not the case for their M9 PV series. After a short time on green gas a crack begins to form around the safety and eventually the back of the slide will blow clean off after continued use of high powered gas. The SVI series will also break it's slide in half (usually rocketing the rear portion of the slide right into the shooter's face) after a fair bit of green gas use. So, based on my experience I'd say stick to 134a or 152a for WA Pistols. Of course the M9 series and SVI series both have powdered aluminum mixed in with the plastic in the slide to give it a more metallic feel, which unfortuantely makes the slide more brittle and causes these breakages on high powered gasses. I believe much of their newer 1911 series uses all ABS slides with no powdered aluminum mixed in, which would explain why the 1911 slides aren't exploding on green gas. Indeed the SCW3 pistols are fixed hopup, but they perform beautifully on duster gas (134a or 152a) with 0.25g BBs. I actually rather like fixed hopups myself... maybe it's too many nightmares remembering my Marui Desert Eagle that would turn it's hopup off from the recoil while shooting or KSC/KWA's drum hopup system that never seemed to adjust quite right. It's just one less thing that can go wrong with the gun IMHO. Those are great news! 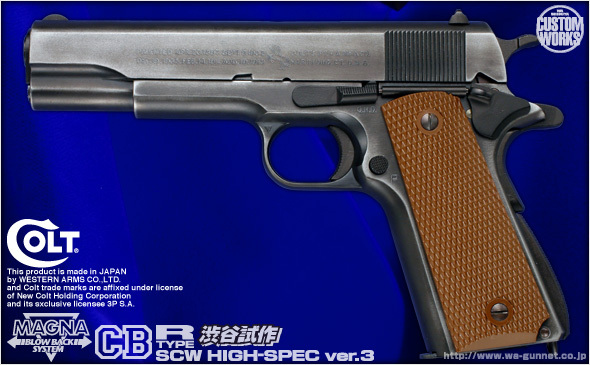 But what i wanted to see it´s a caspian 1911 for my cag impression LOL! As pointed, fixed hop is fantastic. You just have to find the bb that hits its sweet spot. My SCW3 really likes SiiS .28g (1.1J with begadi yellow gas). Almost comparable range to a one with a Sheriff LRB, but much more consistent performance. Beretta, model 1934 pistol, light weight model marked "Tipo Alleggerita" or "All" having transverse ribbed barrel, cal. 9mm.